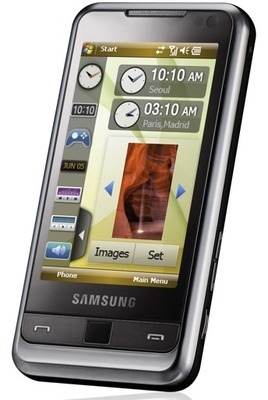 Last night, at a lavish event in London, Samsung proudly paraded its brand new 3G Windows Mobile 6.1-based touchscreen handset, the SGH-i900 -aka Omnia. The Omnia was first seen back in April at a European trade fair, but it hasn't been known exactly when Samsung would make its frontal assault on the iPhone available in the UK, despite officially unveiling it to the world in June. Based around a 3.2in, 240 x 400 display, the Omnia also packs in a GPSpick-up, FM radio, A2DP wireless stereo, Bluetooth 2.0, Wi-Fi and a choice of either 8GB or 16GB on-board storage. Users can up that capacity with Micro SDHC cards. The handset has quad-band GSM/GPRS/Edge connectivity plus 3G HSDPA for data downloads of up to 7.2Mb/s. On the back is a five-megapixel camera with image stabilisation, autofocus, and photography flavours of the month face and smile detection. Full pricing details weren't provided, but the eagerly-awaited handset is officially on sale from today on all UK networks including Vodafone, O2, Virgin Mobile, 3 and T-Mobile. According to Samsung, a 16GB version is available exclusively on Orange for a limited period of time. Whether the 16GB variant will then become available on other networks is as yet unclear.